Should Transit Systems Be Designed for the Handicapped? Sure, we want equal accessibility for all… but at what cost? Yesterday, New Jersey Transit held a groundbreaking ceremony at the Somerville Train Station for improvements that will make the stop along the Raritan Valley Commuter Rail Line accessible to the disabled. The station renovations will be complete by 2010, but the project is part of a long-term effort that will eventually make all 130 of the system’s stations easier to use for those with limited mobility. NJ Transit isn’t alone; networks all over the country are investing in similar improvements to older lines, adding elevators, level platforms, and ramps to making getting to and from trains possible for those in wheelchairs. The 1990 Americans with Disabilities Act made it required for new and renovated facilities to make a “good faith” effort to ensure that people with disabilities are not discriminated against in the public sphere. The results have been slow but steady expenditures for that purpose. Lines that people in wheelchairs once could not use at all are now speckled with handicap-friendly stations. 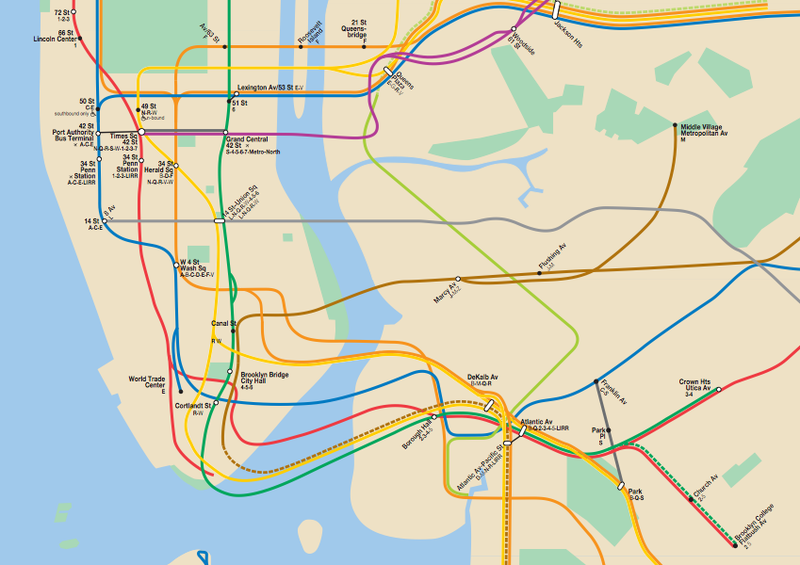 See the map above (from smogr) for the wheelchair-friendly stations of the New York Subway. The problem is that investing in equipment like elevators and ramps is incredibly expensive – part of the reason that renovating a New York City subway station, for instance, is so much more expensive than making improvements in stations of the London Underground or Paris Métro, where the transit agencies are not required to provide access to the mobility-impaired. The cost of maintenance, too, is out of control: New York has spent about $1 billion over the past fifteen years installing elevators, but they fall out of service so regularly that it is difficult for the handicapped to rely on their being in service. In 2007, one of every six elevators in the system was out of commission for more than a month! When the Washington Metro’s first lines were being designed in the early 1970s, the question of whether to include elevators became a major point of contention between Metro chief Jack Graham and members of the Congress, who had passed the Architectural Barriers Act of 1968, requiring federally-funded buildings to be handicap-accessible, according to Zachary Schrag’s The Great Subway Society. The system had been designed with five categories of the handicapped in mind: the semi-ambulatory, the uncoordinated, the aging, and those with sight and hearing problems. That’s part of the reason platforms on the Metro flash when trains arrive and there are no stairs that aren’t duplicated by escalators. But the initial design didn’t do much for those in wheelchairs. Design and construction costs for elevators were expensive, so in a demonstration at Dulles Airport, Graham attempted to convince Metro’s board that those in wheelchairs would be able to ascend and descend escalators in their chairs. Graham made a fool of himself, and the result was a court-imposed requirement that all Metro stations incorporate full handicap access. All new transit projects since have done the same. Graham’s insistence that the handicapped would be better served by a paratransit program, which would cost far less to maintain, since it would merely require the purchase of wheelchair-capable buses, was prescient considering the constant elevator outages that continue to plague the Metro system. Indeed, the elevator problems as well as the lack of fully accessible buses forced Washington to implement the Metro Access transit program, which provides shared-ride, door-to-door service to the disabled throughout the region. Not only was Metro designed for the handicapped, but they also benefit from service close to taxi runs at transit prices. I think it would be hard to argue that new subway systems shouldn’t be designed from the start with handicap access to all levels. We shouldn’t be designing our transit systems to be discriminatory from the start. In addition, people without wheelchairs – transporting goods, on crutches, simply tired – take advantage of elevators. But should we be spending millions of dollars on upgrading ancient stations to handicap accessibility when those improvements fail so often in actual use and when the handicapped have other options? And the speed of renovation is so slow that, as the map above demonstrates, even after years of work, very little of the New York subway system can actually be used by people in wheelchairs. On the other hand, if we share a societal goal to incorporate the handicapped as much as possible, is there any excuse not to fund improvements for them, and shouldn’t we speed up those repairs? The middle-ground upon which most transit agencies appear to be making policy – in which a few stations are upgraded with oft-malfunctioning elevators – is expensive and problematic. It wasn’t these problems that forced WMATA to operate paratransit service, it was the ADA that requires service to those living within a 3/4 mile of a transit line or station. This service is expensive to provide, at almost $40 per trip, and is heavily subsidized. That’s why people have to obtain certification that they really cannot use the normal transit, with wheelchair-lift buses, elevators, and heavy rail. When an elevator is out of service, shuttle is provided from the next station. If you can do it, you want to upgrade the system so paratransit is not necessary. What about what they call “travelators” in Australia … escalators built as a moving ramp rather than as moving stairs. If a shopping car can go up and down one, couldn’t a wheelchair? Interesting point. Perhaps some combination of paratransit and (reliable) elevator access at major stations would be the best solution. as the “expert” that assisted in overturning the old pre ADA paratransit regulations and one of the people who helped write the ADA transportation regulations I can say absolutely that most of the concepts put forth here have been proven inaccurate in court. no transit system would go back to paratransit even if they could, it is an economic black hole, because the law does not permit any limits on service. the original problem with the old rules was that it had artificial limits on the number of trips or people who could get paratransit service. Another problem is the level of service, paratransit is not like a cab, you have to make reservations in advance, if you need to work overtime, you can’t get home, finish early, still wait for your reservation. the Subways need to be accessible for the same reason everyone else rides the subway, I tested it once in New York it took over an hour and 20 minutes to get from Central Park to the World trade center by bus, a return on the subway was less than 15 minutes. and tihs wasn’t rush hour. while occasionally an elevator is out of service it is not a common occurance newer and more robust elevators are being installed in most systems currently. PS 1 travelators are nice but need to be a much shallower angle than an escalator and in crowded cities Elevators are actually cheaper because they use a smaller opening or footprint from surface to subway. PS 2 the Eurounion has similar disability access laws and the London Underground and Paris Metro are being made accessible also by law. as is Tokyo and other systems around the world. PS 3 no one is more frustrated by the foot dragging of some transit systems on making subways accessible than persons with disabilities, the Archetectural Barriers Act is over 30 years old what other group has been forced to wait that long for equality? It is astounding how few people in the transportation community are at all in touch with the demographic crisis that is about to call our entire transportation system into question. Of course I am talking about the Grey Boom. We all like to complain or joke about elderly drivers, but they can’t come off the road if they have no alternative. Just like the previous commenter noted ParaTransit services are very expensive and additionally are often uncoordinated in terms of an elderly person’s destination needs (think trips to doctors appointments, pharmacies, grocery stores etc. which may not be suitable for MediVan or ParaTransit). We’ll need to make sure our existing systems are ready for this massive soon to be elderly cohort. Futher – I live in Boston on the blue line which is currently undergoing a modernization. I would argue that if it weren’t for the pressure to make the T more ADA compliant the blue line would still rotting away. I’m sure we’d all love to see projects happen faster, easier, and cheaper but we can’t neglect members of our society that aren’t fully able. Lastly – DO NOT give in and say its not worth installing elevators just because of broken elevators or escalators in certain systems. INSIST on maintenance! The elevator in myapartment building works and has worked for ages – its because someone cares about it. I would call into question the motives and values of the people budgeting for the installation of cheap, sh^tty elevators or for cutting crucial maintenance. Why spend the money to install elevators and not spend the money to keep them working? Everywhere I go, I see functioning elevators, and the ones in transit stations should be no different. I’ve often used the elevators in Washington and Boston and have no handicap at all (other than all the foibles of being human). I bring suitcases with wheels on board elevators with some regularity – at hotels and on transit systems. Our society has a level of expectation of customer service and mobility that is established (see JP’s comment above). Would you argue that hotels shouldn’t have elevators? Would you just shrug if they were all out of service? No. Regarding paratransit – maybe it’s time to de-emphasize organized paratransit and instead move toward cab vouchers for those who need and cabs with wheelchair access (perhaps mini-vans rather than full cutaways). I wonder what Graham would say if he were required to travel by Paratransit all the time. What does “separate but equal” mean? That concept was ruled illegal for public education. Is it illegal for public transportation as well? I enjoy commuting to/from work by Mainline because the Mainline buses here in Madison, Wisconsin have ramps that enable me to board. Ambulatory people with other special needs are also accommodated. We also have a paratransit service because some people just cannot ride Mainline for one reason or another. The true operating cost of a paratransit trip one way is about $30 compared to about $5 for a Mainline trip. At what point is retrofitting older transit stations financially wise just based on this differential alone, even barring other considerations? The UK has the “Disability Discrimination Act”, which is their equivalent of the ADA. It isn’t quite as strict, but basically the transit agency has to either plead “impossibility” (which they can do in the US too) or say that they’re only doing minor cosmetic improvements — otherwise they have to revise the station to make it fully accessible. Also, I will note that Transport for London took advantage of the DDA. They decided that as long as they’re making the system wheelchair accessible, they will encourage the use of the same facilities for strollers, baggage, et cetera. Making a virtue of necessity. The NYC Subway has had the opposite attitude — a bad attitude. Glad to hear that about Paris (I don’t read French). The incredibly close spacing of the Paris stations is going to make it by far the hardest system in the world to make accessible. I know every system I visited in Germany was slowly being made accessible, and that was back in the 1990s, so the laws must be even older there. Paratransit is totally inadequate to meet the needs of the disabled. My partner has MS, so has numerous doctor’s appointments to attend (internist, neurologist, neurosurgeon, ophthamologist, endocrinologist). After he moved in with me and while I was still working he investigated the possibility of using SMART (southeast Michigan) paratransit. He found not only do you have to make a reservation, the actual pickup time can be 30 minutes either side of the estimated time. So, you have to be ready to go (the bus only waits in your driveway for a minute or so) well in advance of the estimated time, and could be waiting for up to an hour if it arrives at the end of the window. At the doctor’s office, you could have an hour wait until the appointment time. For the return trip, they will schedule a firm pickup time, but if the doctor is running late or schedules unexpected tests, you might miss that time and be out of luck for getting home. As a result, we decided I would be the paratransit and would take time off work for his appointments (it works really well if you schedule the appointments at the beginning or end of the day and have a boss who is willing to work with you on these things). And now that I’m retired, my car is the default option. Sorry, but paratransit is one of those things (like restaurants whose disabled entrance winds through the kitchen – we’ve seen that too) that reminds disabled people that they’re second-class citizens, and that their time has no value. One thing not mentioned here is that it takes an inordinate amount of time and effort to chair-lift a disabled person onto a busy bus. I don’t by any means begrudge wheelchair bound travelers a bus ride however as I type this I’m on a NJ Transit bus over 17 minutes into getting just one handicapped passenger on board. Everyone on the bus is frustrated, many have gotten off the bus and a vocal few are lamenting the fact that they’re going to be late for work. I know I’ve missed my connecting bus by now as well. Transit systems that accept disabled passengers need to be much more efficient than they are. Ask any bus-rider who’s had their entire day’s schedule ruined by the misfortune of having two disabled riders board their bus during a single trip.